So, we hear that you want to dress up as Newt Scamander for Halloween except you have one problem: you don't like wearing uncomfortable clothes, like ties and stiff trousers. We can tell that you're a person who is all about comfort and we admire that! Well, we are pleased to let you know that this Fantastic Beasts comfy throw will make all your style dreams come true. This product is basically like a blanket you can wear. Plus, it also has the power to transform you into a very famous Magizoologist. Pretty magical, huh? This fleece throw has sleeves so put your arms through and you are now wearing a blankie. 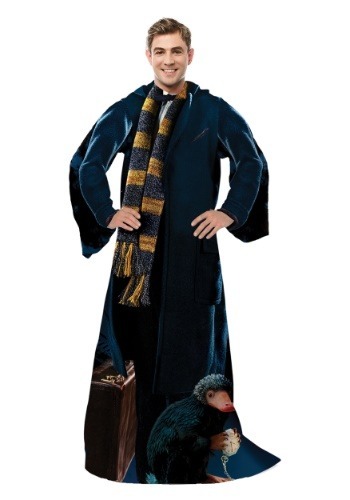 It is printed with an image of a Niffler, Newt's enchanted briefcase, and the trusty Hufflepuff scarf he got from attending Hogwarts. Wear it when your chilly, wear it as a costume, or when you want to shield yourself from an Obscurus on the loose!